Beni Ourain rugs are famous for their black and white traditional design. 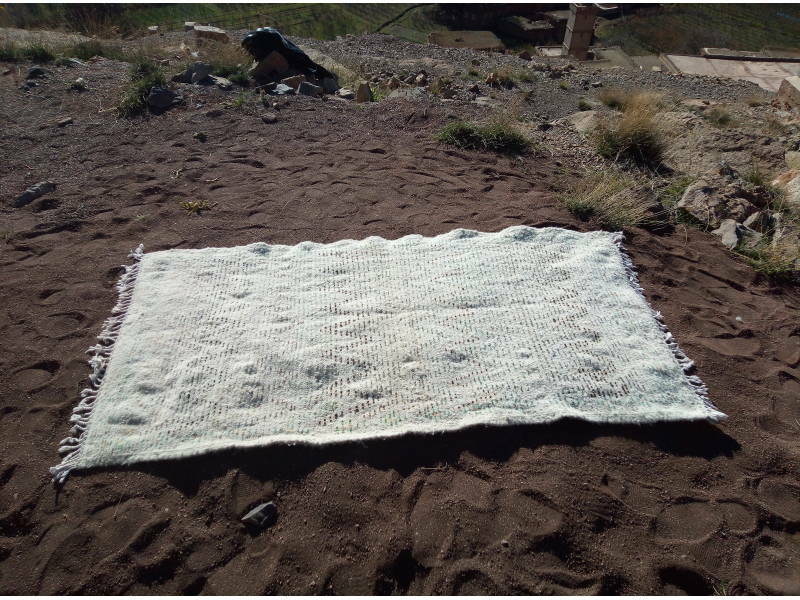 This style comes from the High and Middle Atlas Mountains, and is not only made as a practical warm rug, but also as a decorative rug for celebrations. 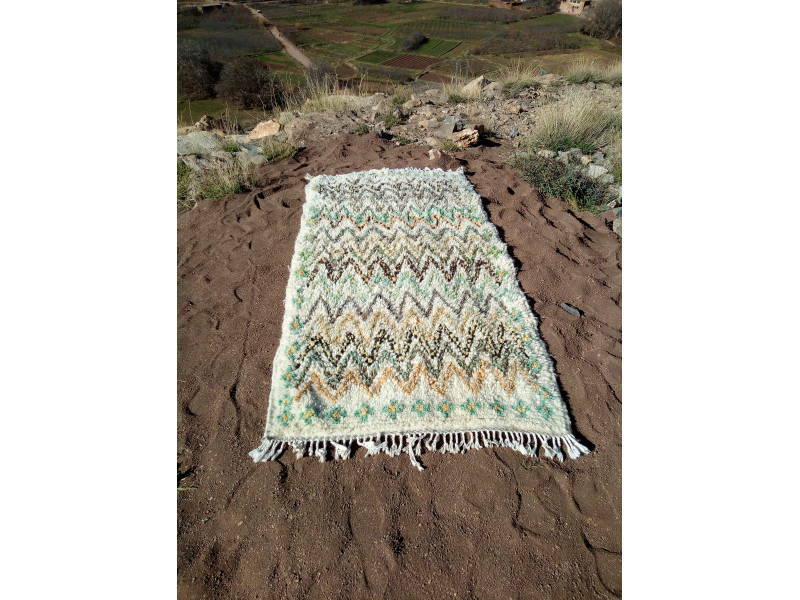 This simple plush rug can add warmth and a traditional Moroccan feel to any room. 2079Dh: This price includes shipping within Morocco. To order, e-mail us at hello@theanou.com and we will help you with payment options. 2079Dh: Le prix inclut la livraison au Maroc. Pour passer commande envoyez nous un message à l'adresse hello@theanou.com et nous vous présenterons les différentes options de paiement. Want to visit Cooperative Ixf N'Ighir in person? The cost is $10 USD per person, all of which is donated to the cooperative. Visits include tea, snacks and work demonstrations! Fill out the form below and we'll send you additional details and payment options when artisans confirm your time. 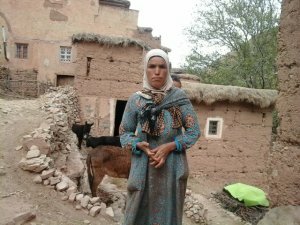 Fatima was born in Ait Bouli in 1983 and is married. She attended school through the 5th grade, but left ... show more Fatima was born in Ait Bouli in 1983 and is married. She attended school through the 5th grade, but left in order to get married at a young age. 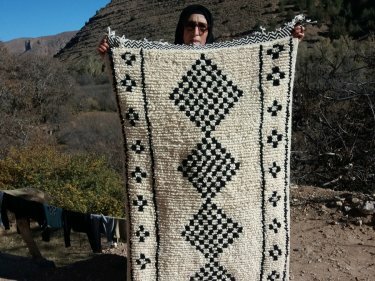 Her mother taught her how to weave as a girl and she joined the cooperative to help her husband financially because he is ill and unable to earn sustainable income. 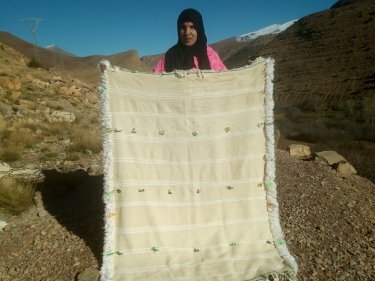 Fatima hopes that the cooperative continues to improve and that her skills in weaving can continue to grow. 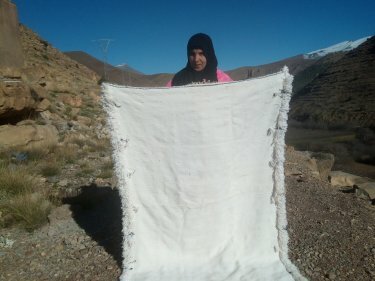 This genuine natural wool comes from local sheep herds and can be found in souk, ... show more This genuine natural wool comes from local sheep herds and can be found in souk, or marketplace. 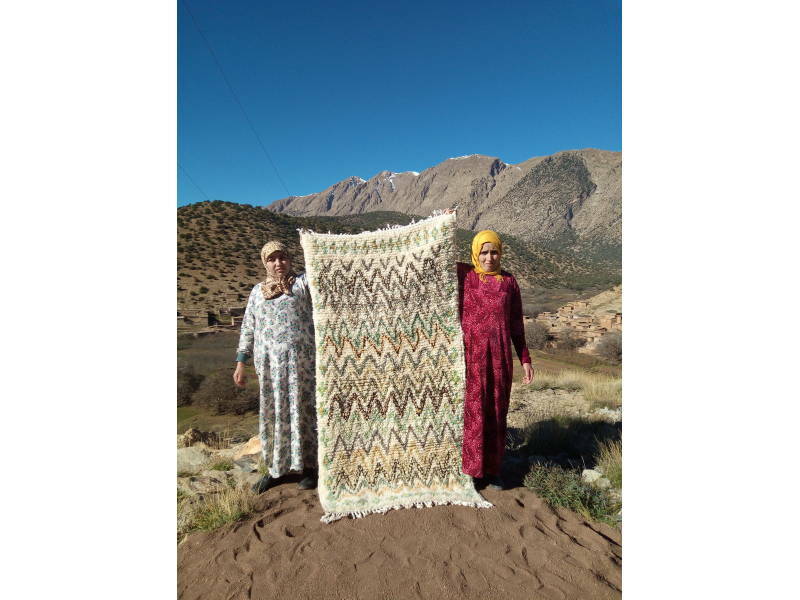 However, this cooperative only uses wool made from their homes and sheep, rather than buying it at the souk. 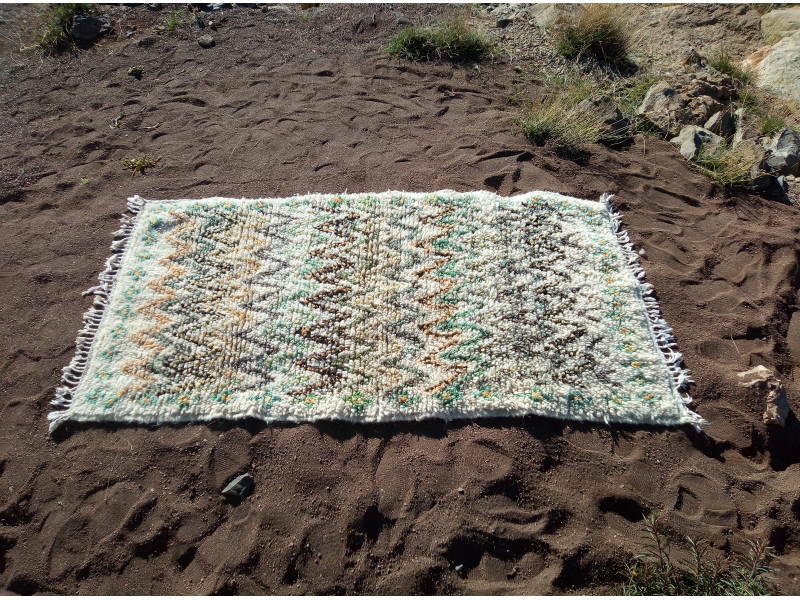 This rug is made using a 100% cotton warp. Cotton warp provides strong integrity of ... show more This rug is made using a 100% cotton warp. 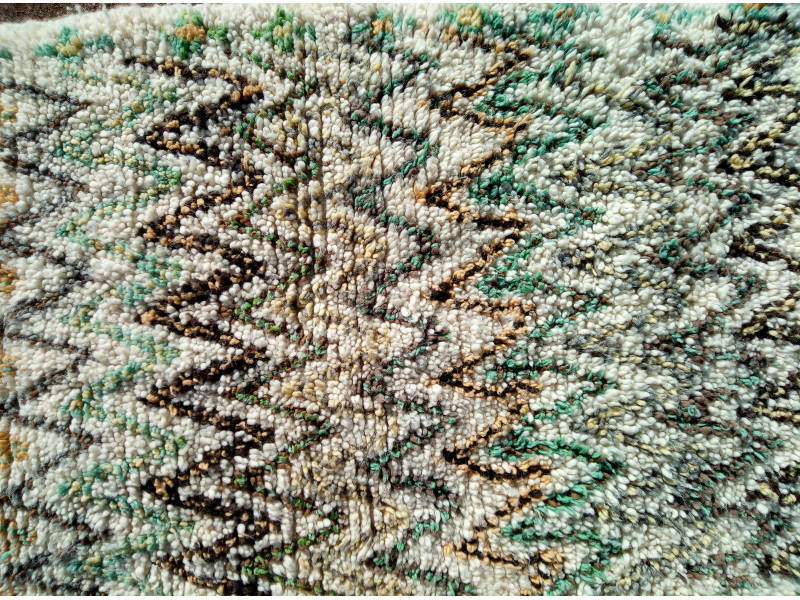 Cotton warp provides strong integrity of the rug over time. The Amshtan is the traditional tool used to clean out and spin natural wool. show more The Amshtan is the traditional tool used to clean out and spin natural wool. The Tsagel is made from iron and is used to press down each level of ... show more The Tsagel is made from iron and is used to press down each level of warp as the rug is woven. This wooden tool takes freshly cleaned wool and spins it into thick thread that can ... show more This wooden tool takes freshly cleaned wool and spins it into thick thread that can be used to weave. This single, tried and true loom, which the woman believe is nearly 50 years old, ... show more This single, tried and true loom, which the woman believe is nearly 50 years old, is now the Ixf N'Ghir Cooperative's workhorse. When the loom was created, it was likely controversial because the wood was expensive to source. It would take a whole village to invest in one. As such, only a couple of looms like these exist in Ixf N'ghir and are passed from family to family throughout the year.